First Endurance continues to stay at the forefront of endurance nutrition by developing PreRace, a revolutionary new pre-exercise supplement that provides endurance athletes with a potent mental and cardiac jump-start prior to a race or workout. 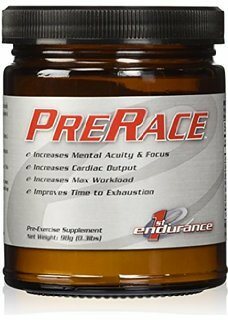 Like all First Endurance products, PreRace is legal and uses clinically effective doses of nutrients, making it the most effective pre-exercise supplement on the market. Many sponsored athletes including the Priority Healthy professional cycling team, the Gerolsteiner professional cycling team, Dave Zabriskie (CSC), Tina Pic (4-time National Criterium Champion), pro triathletes, runners and swimmers tested prototypes through the spring months. The athletes offered rave reviews and have continually asked for more PreRace samples. First Endurance says this revolutionary pre-exercise supplement is formulated with a Mental Acuity component comprised of DiMethyl Amino Ethanol (DMAE), Metabromine and Catechin which deliver a clear mental focus prior to exercise. Citrulline Malate and L-Tauring improve cardiac output, stimulate the Nitric Oxide (NO) system and clear lactate. First Endurance says this proprietary formula works synergistically with Quercetin, a powerful antioxidant that improves time to exhaustion in endurance athletes, and 200mg of Caffeine. PreRace comes as a flavor-free powder which can be added to any exercise drink. Use Directions: Mix one heaping scoop into EFS Energy drink or your favorite pre-exercise drink. Consume 30 to 45 minutes before exercise. Begin use with one half the recommended dose to assess your tolerance. Improper use may be hazardous to a person's health.